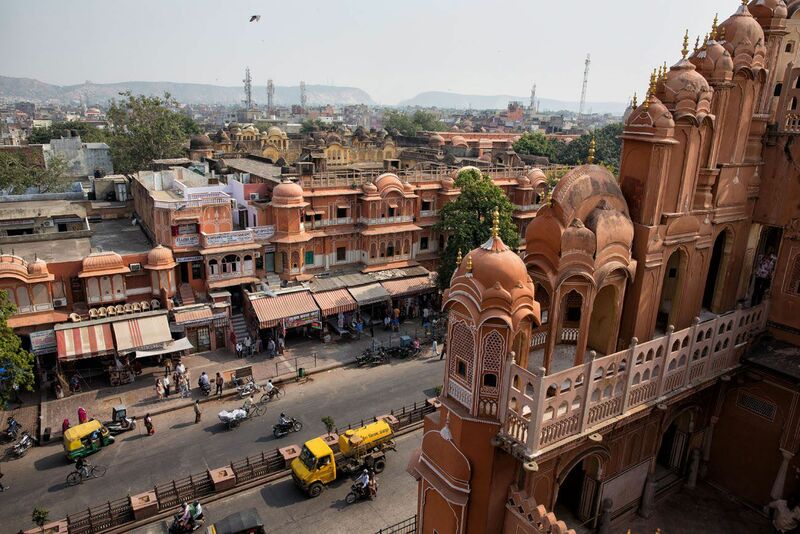 Jaipur is one of three destinations in the “Golden Triangle,” a group of three cities that most people visit even on the quickest trip to India. In the Golden Triangle are New Delhi, the capital of India, Agra, home to the Taj Mahal, and Jaipur, the pink city. 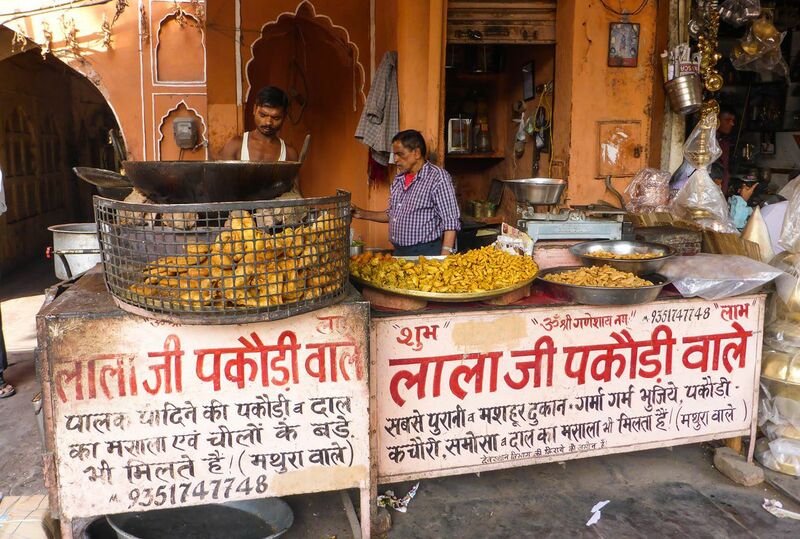 From what I read, most tourists do not love Jaipur. 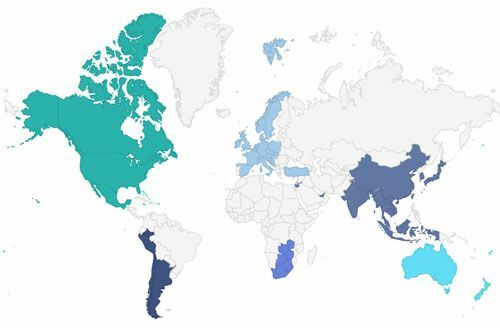 It’s crowded, it’s dirty, and it’s low on the Richter Scale of big sites to visit. 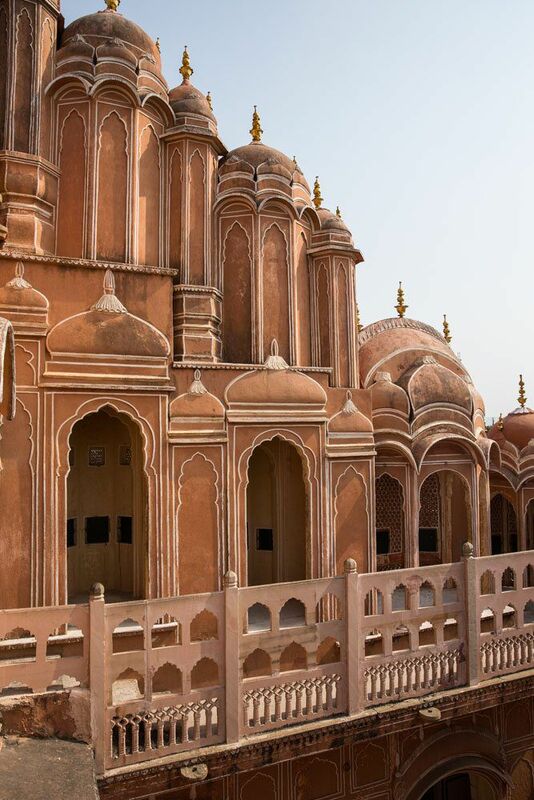 However, it is famous for it’s Pink City, an older area of the city where all of the buildings are painted pink. It was 2014 when we visited Jaipur. 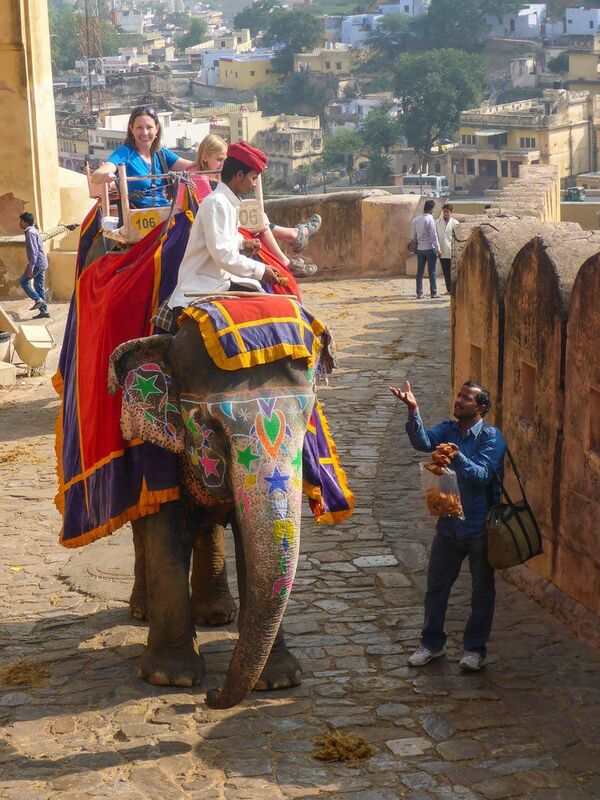 We actually added Jaipur into our India itinerary after watching the Travel Channel as people rode up to the entrance of the fort on the backs of elephants. At the time, it seemed like a great idea, especially since we were traveling with children. Since 2014, more and more information has come out about the mistreatment and abuse of elephants, not only in India but in other countries. 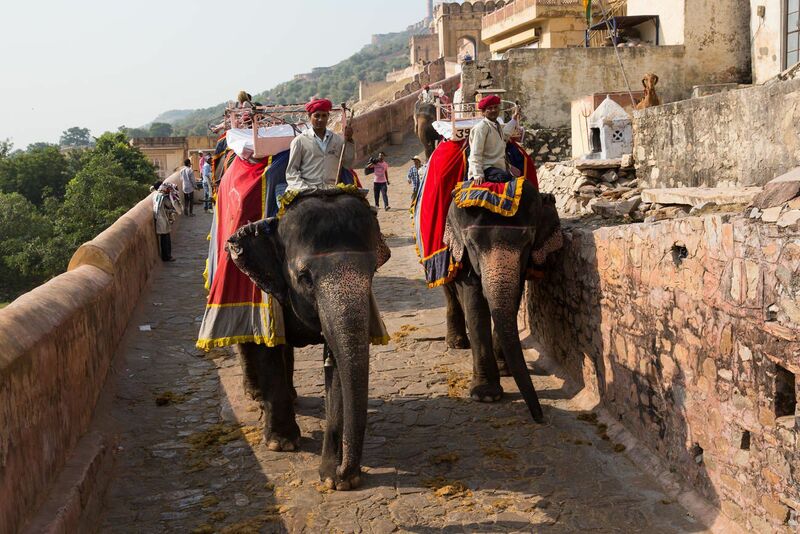 Yes, we did ride elephants at Jaipur, but knowing what we know now, we would choose to skip this experience and walk up on our own two feet instead. 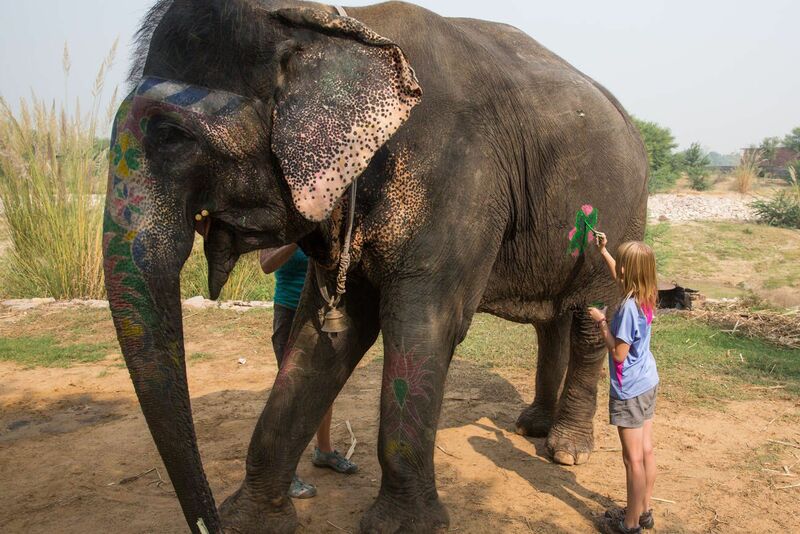 Here is more about our experience and information about the treatment of elephants in India so you can make your own informed decision. 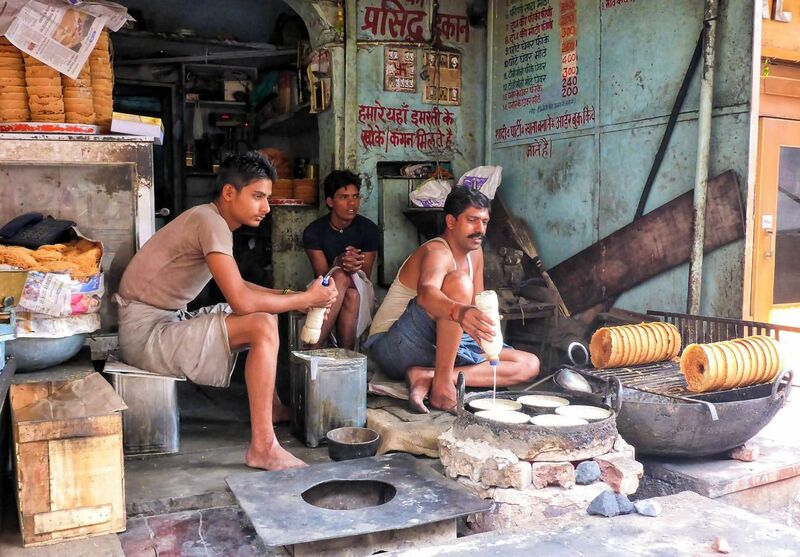 India is packed with temples and forts and Jaipur is no different. 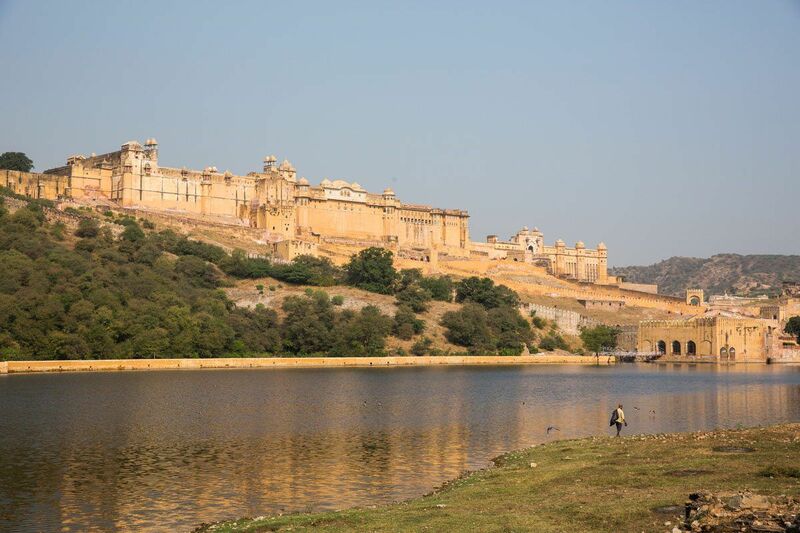 Jaipur is home to the Amber Fort, a fort that overlooks Jaipur from its hilltop position. 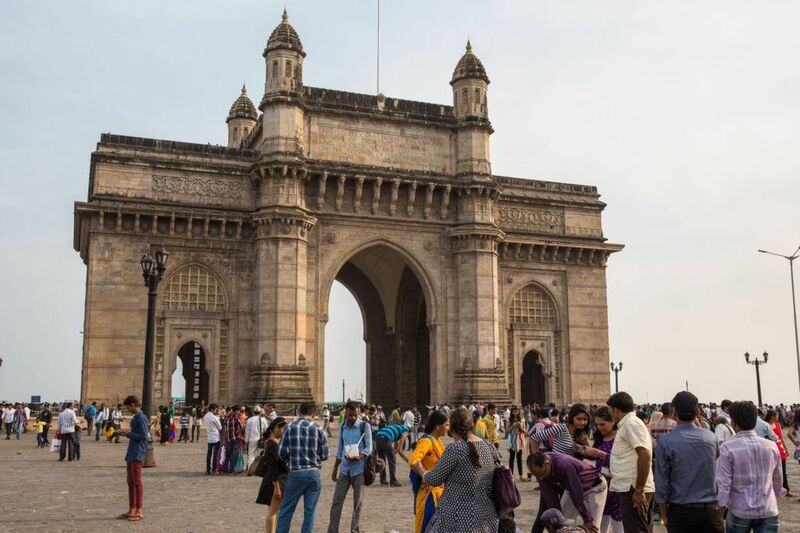 India is famous for its very pushy touts and “official tour guides.” As we walked into the fort we were swarmed by men selling trinkets, men offering to be our guides “for a cheap price,” and children asking for rupees for food. We have been dealing with this all over India but we hit a whole new level in Jaipur. It would only get worse as we would head to Agra. The best thing to do is to ignore everyone and keep walking, but it does really get annoying to always have people in your face. Tim learned that if he starts video taping them they tend to walk away. For three times the price of our rickshaw for the day we hired two elephants to carry us up into the Amber Fort. So, what is it like riding an elephant up to the entrance? It is slow, it is hot, and it is a bit uncomfortable. It takes about 20 minutes for the entire ride and the whole time, touts are very aggressive and highly annoying, as they try to sell you trinkets and souvenirs. Since you are stuck on top of the elephant, all you can do is ignore them, but their presence makes this experience very unpleasant. In 2015 and 2016, lots of information was published about the mistreatment of elephants at the Amber Fort and other locations in India. As young elephants are raised, they are beaten into submission in order to be “tamed” to carry people on their backs. Then, they are forced to carry groups of tourists uphill to the fort entrance, until they are very fatigued. 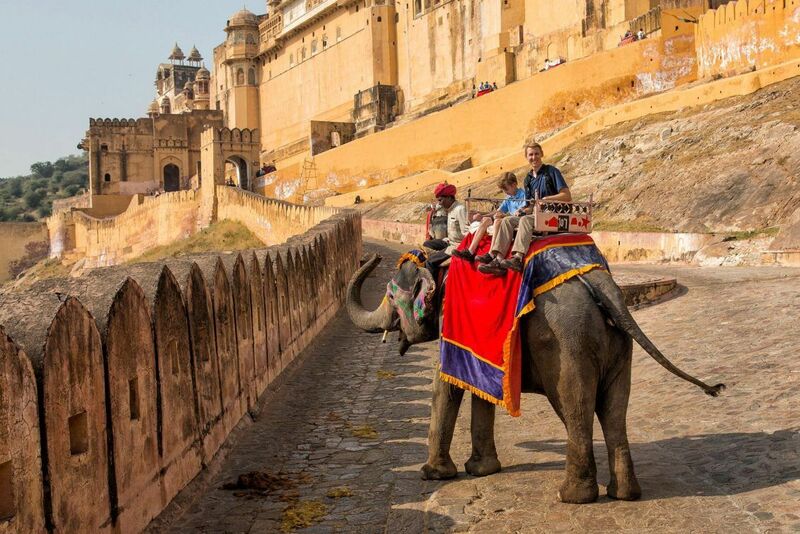 Recently, the Amber Fort has made some changes in the treatment of their elephants. 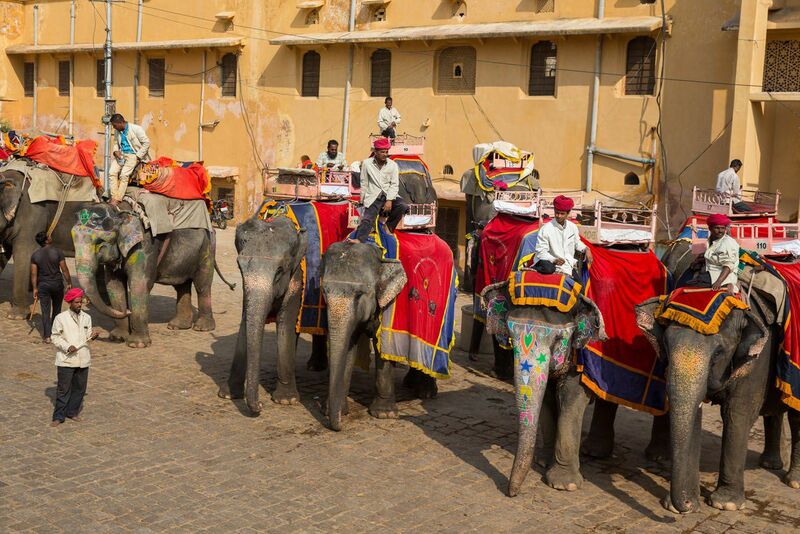 According to the Jaipur Travel Guide, elephants are only permitted to carry two passengers five times per day. This does ease how much the elephant has to work but it does not address the treatment of the animals. I am not telling you that you should not ride the elephants at the Amber Fort. I simply want to provide the information about the treatment of the elephants so you can make your own informed decision. If you choose to skip the elephant ride, you have two options to get to the fort: walk up on your own two feet or hire a Jeep to drive you up for 400 rupees. We spent an hour walking through the fort. 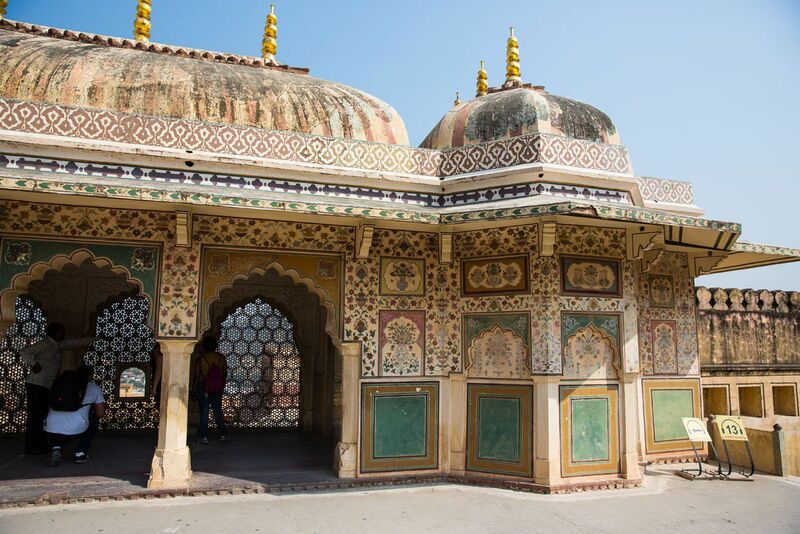 Sites within the fort include the main courtyard (Jaleb Chowk), the maharaja’s apartments, Siladevi Temple, and the Hall of Mirrors (Sheesh Mahal). Outside of the fort we met a snake charmer. Just like you see in the movies, he played his flute and the King Cobra stuck it’s head out of the basket. Kara joined in with the snake charmer. Kara and I got to touch the snakes (he actually had two). They felt very smooth and silky but they were not potty trained. The snake charmer wrapped one of the snakes over my shoulders and the little bugger pooped all over me!! I got pooped on by a King Cobra!! It was hilarious. We cleaned up my shirt with toilet paper, which the snake charmer just threw right out into the street along with all of the other trash. We saw so much wildlife walking through the streets of Jaipur…dogs, cows, mice, donkeys, horses, camels, elephants, pigs, mice, and goats. 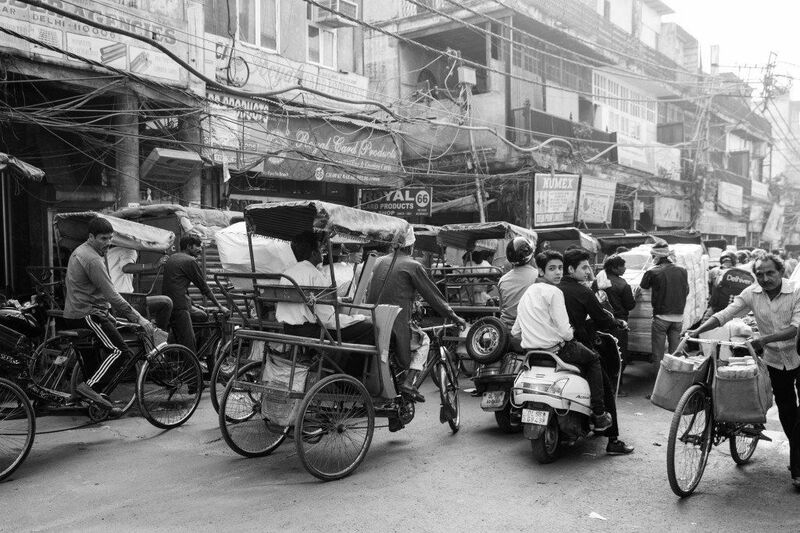 All through the city are people selling food off of carts and at roadside cafes. 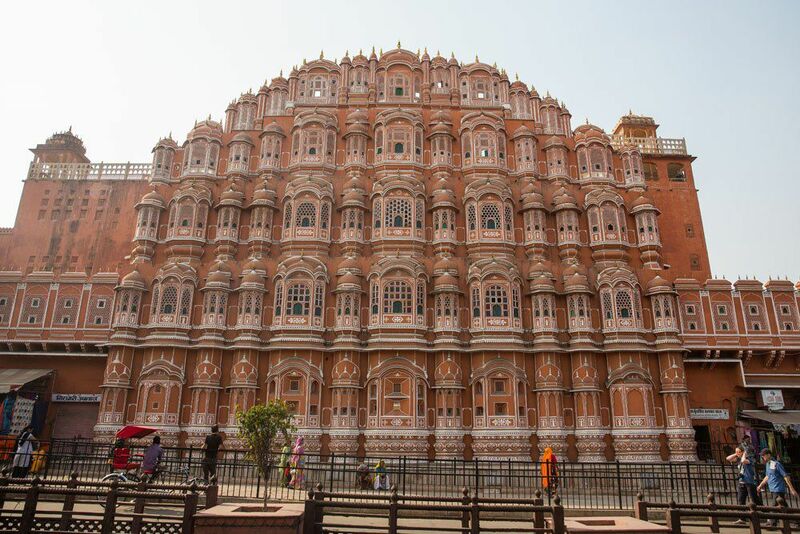 After a visit to the Amber Fort we made a quick stop at Hawa Mahal, the Wind Palace. This place was much more interesting on the outside than the inside. 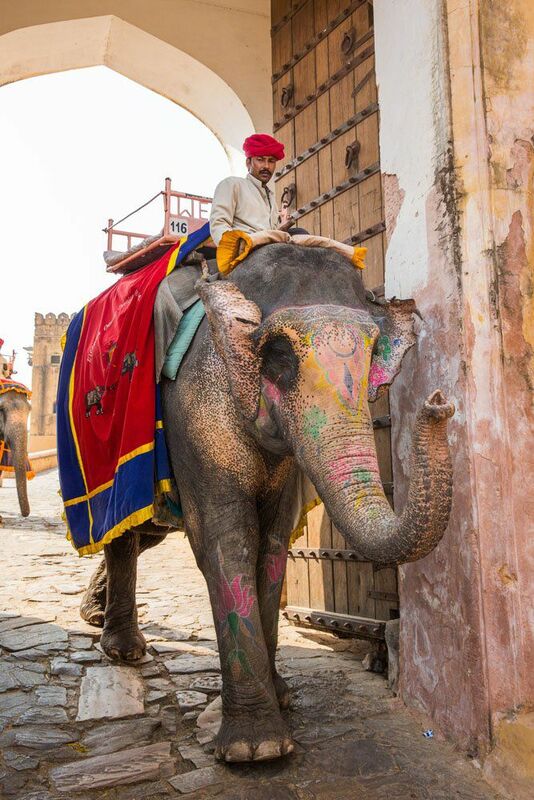 There are numerous places in and around Jaipur offering tourists the chance to feed, ride, paint, and then bathe elephants. Yes, we did this too, and Kara loved every minute of it, but again, there is some controversy as to whether or not this is a good idea. 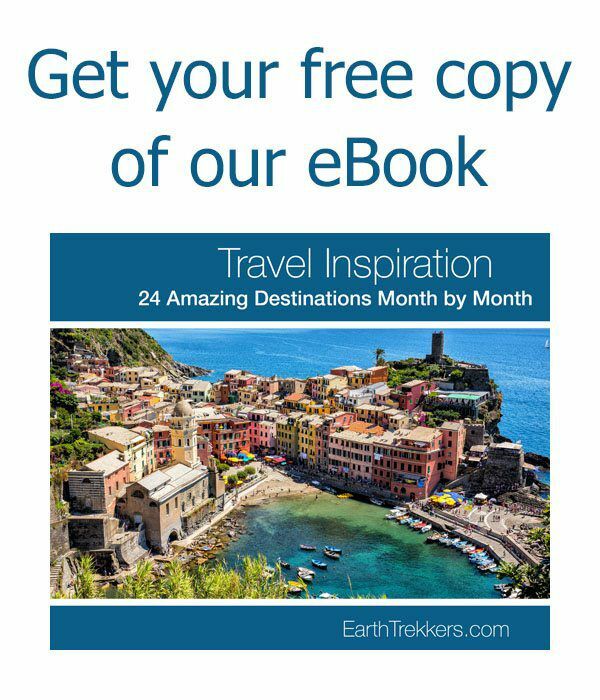 If you are considering this activity, there are two places that get great reviews and state that their elephants are always humanely treated (Elefantastic and Elephant Joy). 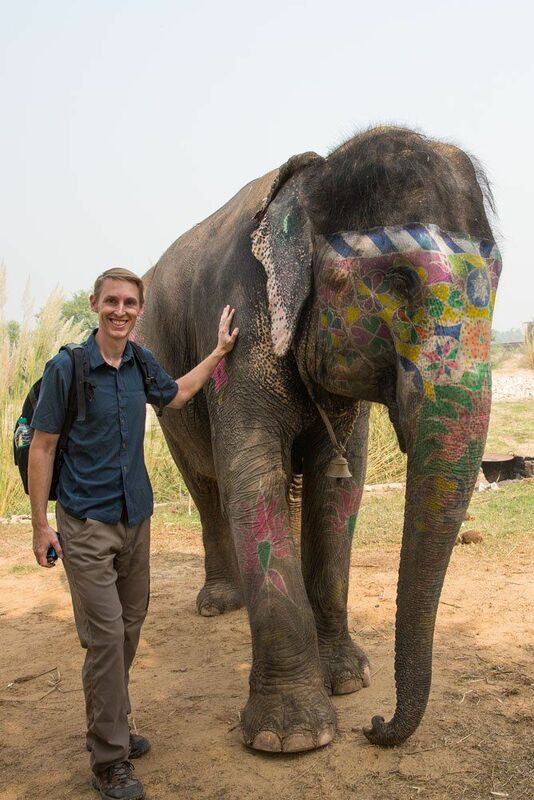 We came to Jaipur to see the elephants but our favorite experience was a trip to the movies. 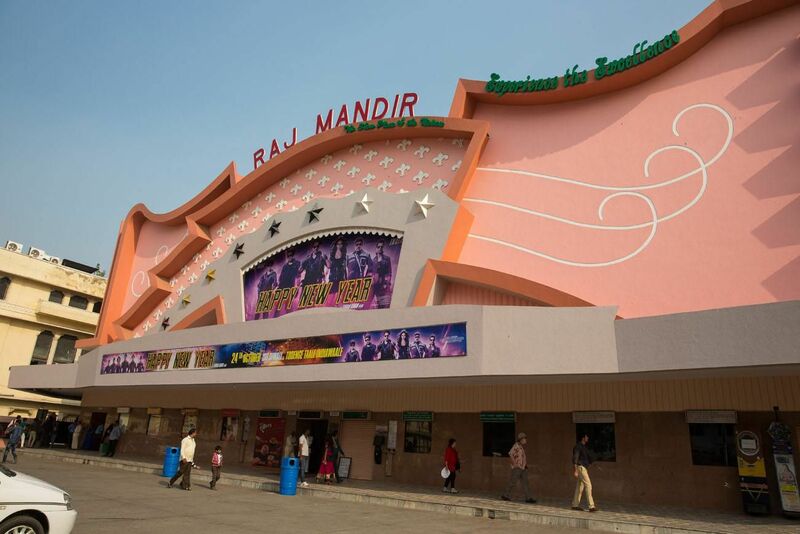 Our last activity in Jaipur was a visit to the Raj Mandir Cinema to watch a Bollywood movie. We were not expecting anything great here…we thought the movie would be boring and that we would have a hard time following it since it would not be in English. Boy, were we wrong! All four of us had a blast!! We took our seats (they are assigned here, not first come first serve like in the US) and the movie promptly started at 3:30 pm. We watched the movie “Happy New Year,” a movie we’ve seen advertised continuously since being in India. What a great cultural experience this was. We learned that Indian films put a HUGE emphasis on six pack abs in the men and wind blown hair in the women. The movie was kind of goofy, hilarious at times, exciting at others. It was action packed and full of great music, singing, and dancing. We loved it! And it was the only movie we have ever been to that there was an intermission halfway through the movie. Some English was spoken and we were all able to follow the main story line. 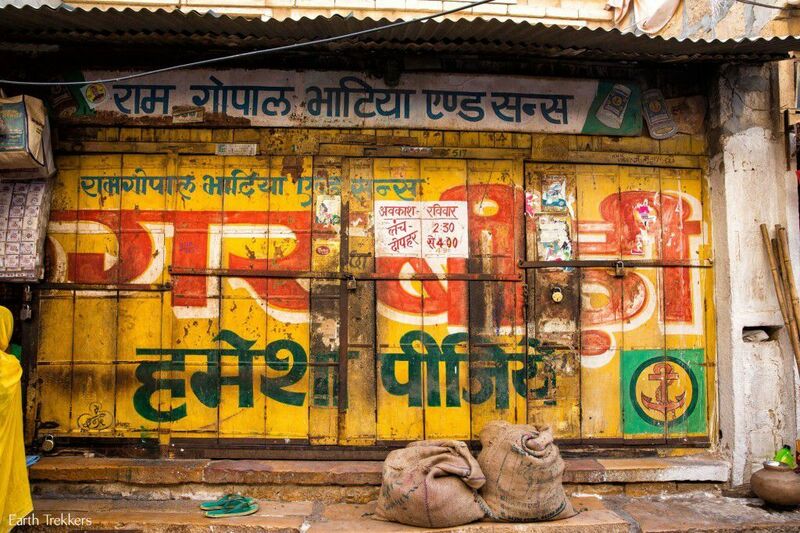 After zip lining in Jodhpur, this was our favorite activity in India. Watching this movie even beat our time with the elephants this morning! It’s always great when something far exceeds your expectations. 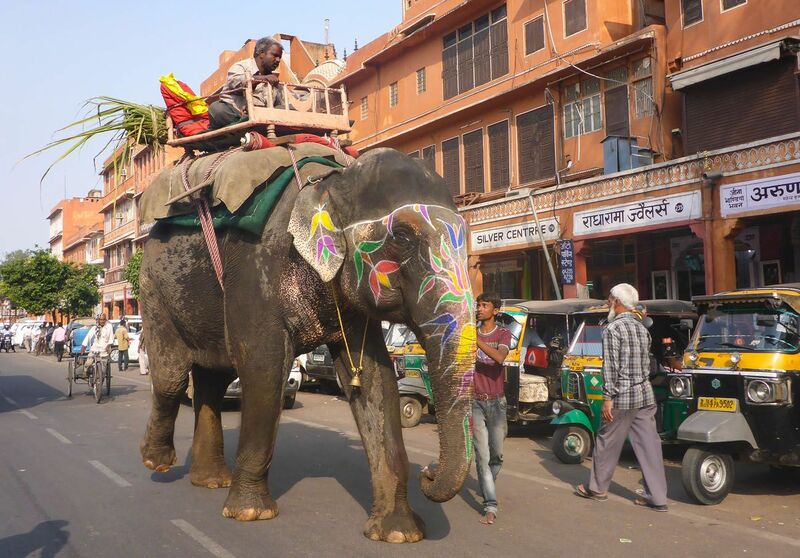 Jaipur was great…elephants, king cobras, and watching a Bollywood movie. 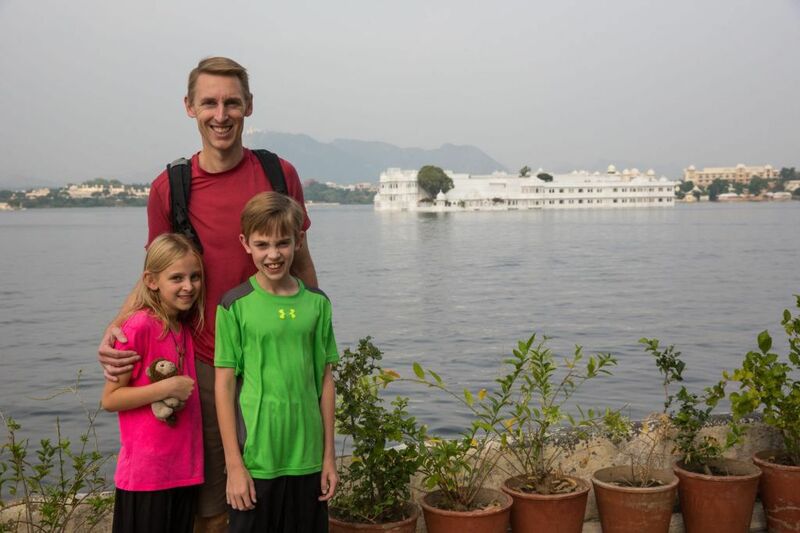 All four us had tons of fun and we feel refreshed and invigorated as we head into our final two weeks in India. It keeps getting better as we head to Agra to see the Taj Mahal! 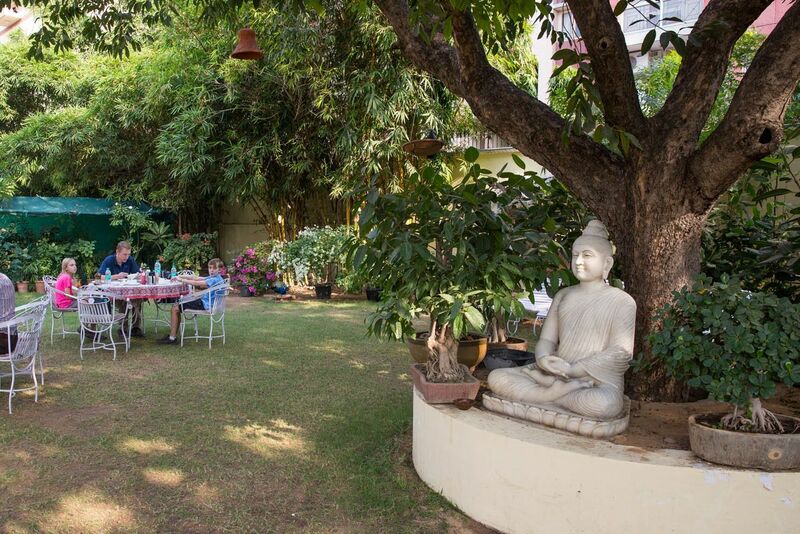 For two nights we stayed at the Anuraag Villa. This place was clean, well decorated, and completely empty of other travelers. I think we were the only guests at the hotel. 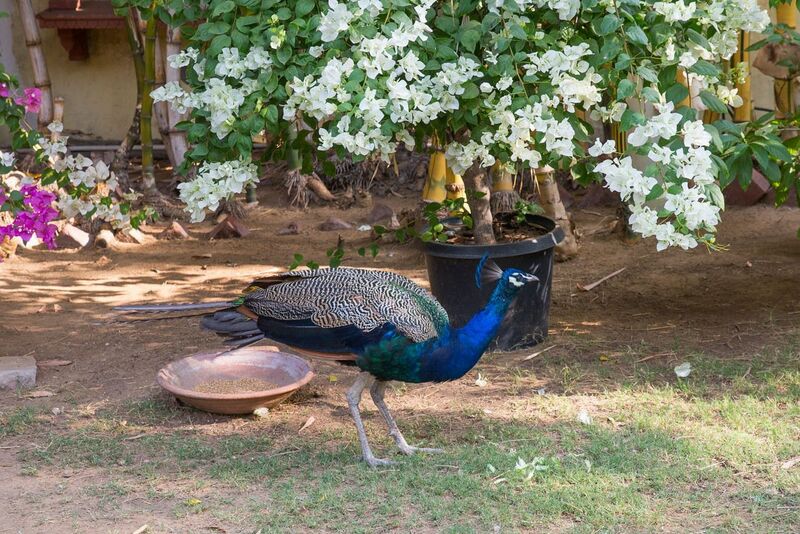 In the mornings we would eat breakfast in the garden, watching as a peacock strutted it’s stuff among the flowers. For two days we hired an auto rickshaw driver to take us around Jaipur. For 600 rupees, or $10, he was our driver from nine to five. 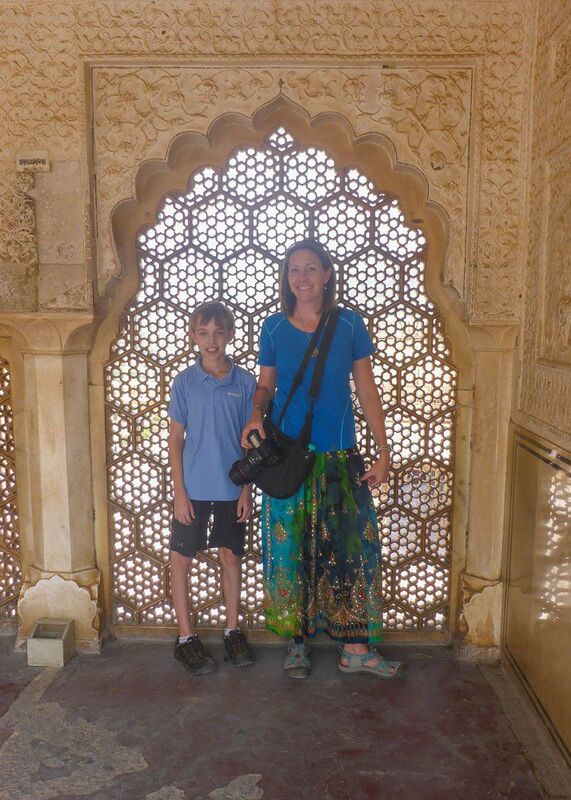 Hi, Julie thanks for sharing your wonderful experiences of Jaipur trip. 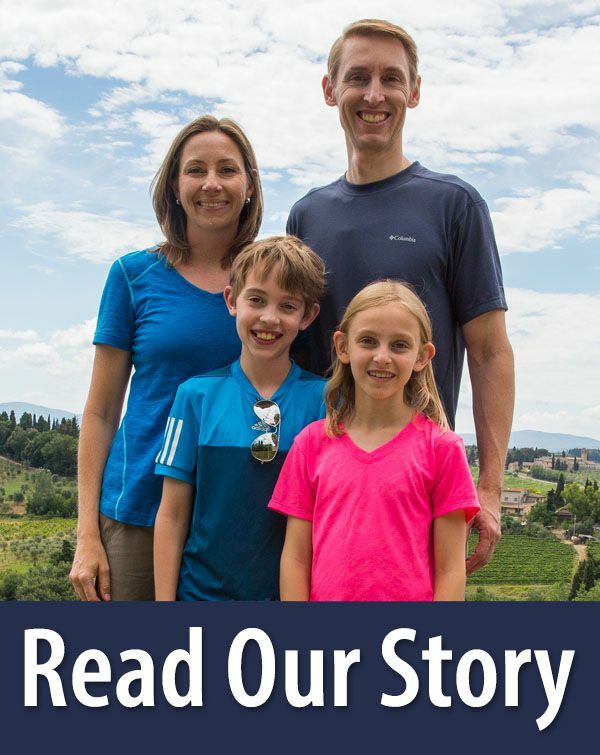 Thanks for sharing 🙂 It must be a wonderful trip for your family. You mentioned about jeep ride to Amber fort costs INR 400. Do you still remember if is it for 1 jeep or 1 person? Do you think the jeep can fit 6 adults? Elephant riding tourism is pretty ugly. In Jaipur one elephant collapsed this year a week before I visited the Amber Ft. They are unwell, exhausted – just read the info. out there. I know it is a complex problem in terms of supporting families, animal well being, etc.. 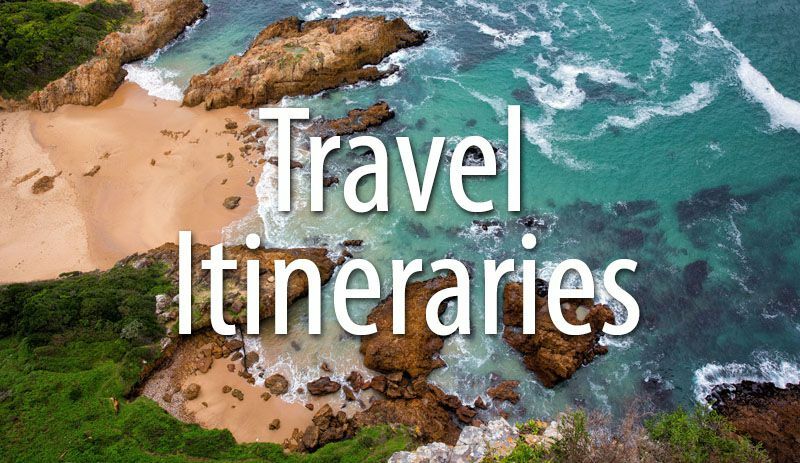 Many tour companies now refuse to participate. That is a huge way to stop cruelty. Thailand says they pride themselves on the importance of the elephant in their culture. 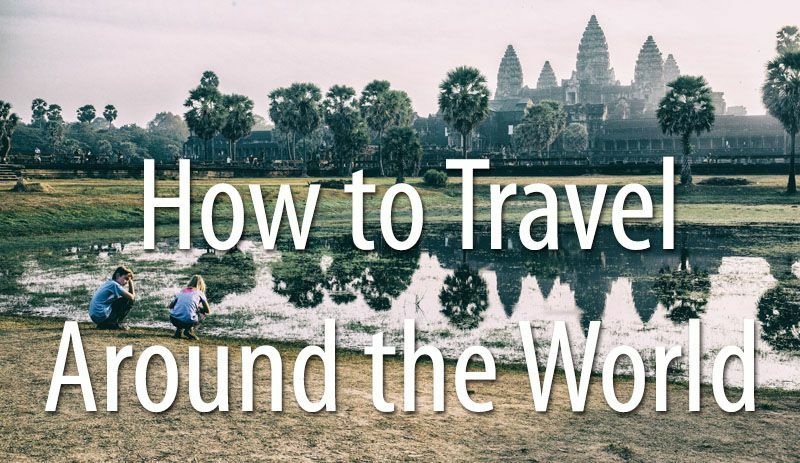 Check out how elephants are broken in all over the world including Thailand. Hi, we are heading to Jaipur in two weeks. Where did you go to ride the elephant, paint the elephant and wash the elephant? this is exactly the activity I am looking to do. 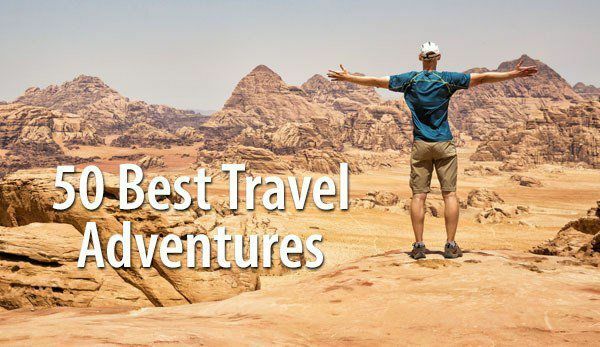 Hello, Thanks for sharing such a fantastic blog.I really appreciate your blog to share information about snake charming elephant riding jaipur …Visiting in Jaipur is amazing experience. Jaipur is a place with a glorious past and a very rich historic background. People come from far off places just to get the taste of its beautiful monuments and their architecture. 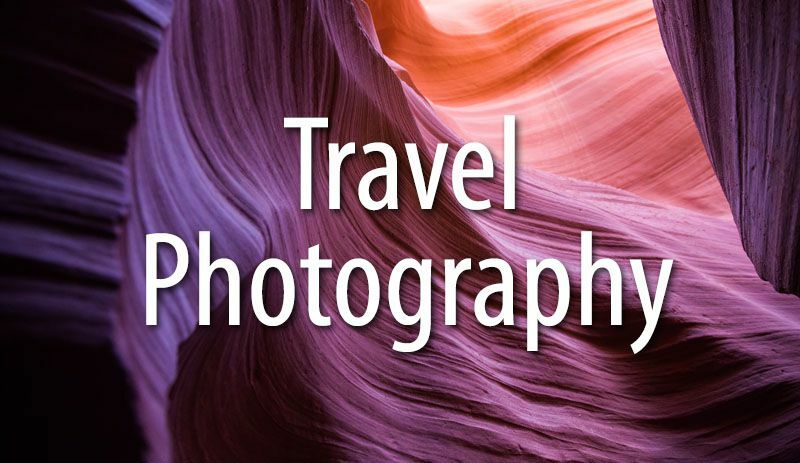 Nice photographs… It’s evident you had a wonderful time in India.